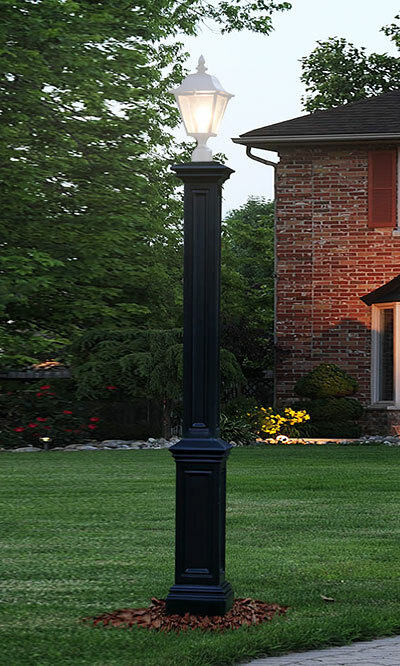 Radiate style in your yard using the Mayne Signature Lamp Post with Ground Mount. The clean lines on this post offer a classic look, for a dramatic addition to your yard. Its 72" height captures attention while supporting your existing light (not included), and the black color blends with your home easily. An included, 89" long piece of aluminum conduit is included in this package, for secure installation of the post and light. The architectural post installs over the conduit easily, and is designed to sit flush on the ground to capitalize on its full height. The post is crafted of lasting polyethylene, complete with UV inhibitors, for a low maintenance and beautiful item. The top accommodates either a solar lamp or a wired light (not included), and the black finish adds versatility. Refine the look of your yard using this Signature Lamp Post with Ground Mount. Made in the USA. Fifteen year limited warranty. Note: This description refers only to the Mayne Signature Lamp Post with Ground Mount, Black. The light shown is not included.